Elián González (born December 6, 1993) is a Cuban citizen who, as a young boy in 2000, became embroiled in a heated international custody and immigration controversy involving the governments of Cuba and the United States, his father, Juan Miguel González Quintana, his other relatives in Cuba and in Miami, Florida and Miami's Cuban American community. González's mother, Elizabeth Brotons Rodríguez, drowned in November 1999 while attempting to leave Cuba with González and her boyfriend to get to the United States. The U.S. Immigration and Naturalization Service (INS) initially placed González with paternal relatives in Miami, who sought to keep him in the United States against his father's demands that González be returned to Cuba. A United States district court ruling from the Southern District of Florida that only González's father, and not his extended relatives, could petition for asylum on the boy's behalf was upheld by the 11th Circuit Court of Appeals. After the U.S. Supreme Court declined to hear the case, by order of U.S. Attorney General Janet Reno, federal agents took González from the paternal relatives and returned him to his father in Cuba in June 2000. Many Cubans had left Cuba for the United States since the Cuban Revolution of 1959. 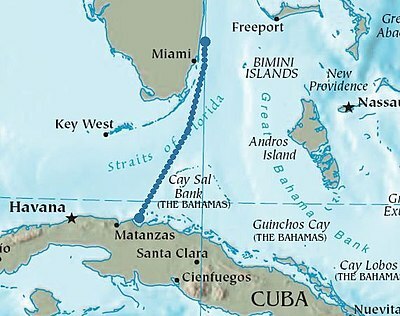 This emigration was illegal under both Cuban and U.S. laws; e.g., any Cuban found at sea attempting to reach U.S. shores could be deported by the United States or be arrested by Cuban authorities. At the time, U.S. policy had evolved into a so-called "wet feet, dry feet" rule. If a Cuban was picked up at sea or walking toward shore, they were repatriated unless they could make a claim of asylum. If they made it to shore (or entered through Mexico) before encountering U.S. authorities, they were generally allowed to remain in the country. The U.S. legislation system enacted The Cuban Adjustment Act in 1966, which sought to provide political asylum for Cubans who fled their country in the hopes of a new life. Under the act, Cuban refugees, without visas, entering the United States were paroled, and after a year could apply for permanent resident status (Cova, 2015). Additionally, the nation also issued 20,000 lottery visas every year to Cuban emigrants per the Wet Foot/Dry Foot Policy (Cova, 2015). Under this policy, those who reached the mainland were granted asylum, while those who were intercepted at sea by the US Coast Guard were sent back to Cuba (Cova, 2015). Elián Gonzalez was a five-year-old boy who was found nestled in an inner tube floating at sea three miles from Florida's Fort Lauderdale, coast (Cova, 2015). Two fishermen found Elián and reluctantly handed him over to the U.S. Coast Guard, as they feared he would be sent back to Cuba under the Wet Foot/Dry Foot Policy since he had not yet reached land (Cova, 2015). The Coast Guard assured them that Elián would be taken “ashore for medical reasons,” deeming him eligible to stay (Cova, 2015, p. 152). Elián was immediately taken to a hospital seeking treatment for dehydration and minor cuts on his body (Cova, 2015). It was later found that Elián's mother, Elisabet Brotons Rodríguez, and Lázaro Munero García, her common-law husband, had escaped Cárdenas, Cuba, as part of a group with fourteen refugees on a 17-foot boat (Cova, 2015). However, the others perished in a storm, while a young couple escaped to the shore, and Elián was found. Once treated, the Immigration and Naturalization Service (INS) provided Elián with a temporary deferral regarding his inspection, and further released Elián to his great-uncle, Lázaro Gonzalez, who lived with his family in Miami's Little Havana (Cova, 2015). These relatives informed the family in Cárdenas to prepare for an extreme hardship visa waiver. The former were told the next day that “some functionary of the government would be coming to get the boy” as a result of Fidel Castro having met with Juan Miguel, Elián's father (Cova, 2015, p. 153). The involvement of the Cuban Communist leader in the case and the subsequent diplomatic note written to the U.S. Department of State emphasizing the father's demand for Elián's repatriation attracted international attention (Cova, 2015). This is because Elián had become a “symbol to many exiles” reminding them of the immense politically and economically oppressive conditions in Cuba that forced a mother to risk her child's life in the hopes of escaping to a better place (Cova, 2015, p. 153 ). While Elián escaped both Cuba and death, he soon entered custody battles waged by his father, Miami relatives, and state actors from the US and Cuba. The international tug of war waged between the Cuban and American actors is understood through state agenda as per Fidel Castro; the Cuban American actor Lazaro Gonzalez representing the Miami relatives and the Miami Cuban expat community; and the US government representative Attorney General Janet Reno. In case of Fidel Castro, he sought to showcase his power by first giving an ultimatum to the US that the boy should be returned to his father within 72 hours (Cova, 2015). Attorney General Janet Reno's objectives regarding the choice she was tasked to make were clear-cut and soundly established in the principle of the laws of the land and the principle of family. The Miami relative's representative, Lazaro Gonazlez, was said to have Elián's best interest and also to uphold the child as a symbol. 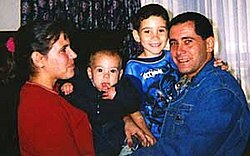 On January 10, 2000, a Florida state court had ruled that the Florida family court was able to decide the merit of motion related with temporary custody by Lazaro Gonzalez, stating that Elián should stay with the Miami relatives until further custody hearing (France-Presse, 2000). However, Ms. Reno presents that the federal courts are responsible for deciding this case, and that the Miami relatives must appeal to the federal court (France-Presse, 2000). Here, the objective of Ms. Reno was to provide the relatives with a chance to provide “any information” they could that would be “relevant in the decision” (“Reno press conference,” 2000). She again emphasized that the INS commissioner had declared that the father speaks speak for the son, and that his wishes were to have his son returned to him (“Reno press conference,” 2000). Cova, A. D. (2015). The Elian Gonzalez case: The world's most watched and politically-charged custody battle that reached the U.S. Supreme Court and determined a presidential election. Harvard Latino Law Review, 18(1), 152-200. The journey from Cárdenas, Cuba to Florida. Elián González was born December 6, 1993 to divorced parents. On November 21, 1999, González, his mother Elizabeth Brotons Rodríguez, and twelve others left Cuba on a small aluminum boat with a faulty engine; González's mother and ten others died in the crossing. González and the other two survivors floated at sea until they were rescued by two fishermen, who handed them over to the U.S. Coast Guard. González's cousin Marisleysis said González told her the motor had broken on the boat and its passengers had tried in vain to bail out the water with nylon bags, but a storm doomed their efforts. He told her he tried to help get the water out and his mother's boyfriend placed him in an inner tube for safety. "He said afterwards that he fell asleep and that when he woke up he never saw his mother again". He said, "I think she drowned too because she didn't know how to swim". Nivaldo Fernández Ferran, one of the three survivors on the boat, said "Elizabeth protected her son to the end". According to Ferran, they set out on their trip at 4 a.m., dragging inflated rubber floats, or inner tubes, in case they needed them. As they encountered bad weather, the boat's engine failed and the craft began to fill with water. After it went under, the passengers clung to the inner tubes in cold water, with waves reaching heights of three to four meters (10 to 13 feet). Afterwards, the Immigration and Naturalization Service (INS) released González to his paternal great-uncle, Lázaro. According to the Washington Post, González's father, Juan Miguel González Quintana, had telephoned Lázaro from Cuba on November 22, 1999, to advise that González and his mother had left Cuba without Juan Miguel's knowledge, and to watch for their arrival. Lázaro González, backed by local Cuban Americans, took the position that the boy should remain in the United States and not be returned to his father. Marisleysis González (Lázaro's adult daughter) became Elián González's caretaker and spokesperson for the paternal relatives. Also, Armando Gutierrez, a local Cuban American businessman, became a spokesman. At the same time, Juan Miguel, with the support of Cuban authorities, demanded that his son be returned to Cuba. On January 21, 2000, Elián González's grandmothers, Mariela Quintana and Raquel Rodríguez, flew from Havana to the United States to seek their grandson's return to Cuba. While they were able to meet with the boy only once at the Miami Beach home of Barry University president Sister Jeanne O'Laughlin, they journeyed to Washington and met with congressmen and Attorney General Janet Reno. After nine days of media coverage (during which Republican lawmakers acknowledged they did not have the votes to pass a bill to give González U.S. citizenship), they returned to Cuba to "a hero's welcome". On January 28, the Spanish Foreign Minister Abel Matutes called for the boy's return to Cuba, stating that international law dictated the return. Meanwhile, the Miami Gonzálezes denied allegations that they had offered Juan Miguel a house and a car if he abandoned the action and joined his son in Miami. Juan Miguel was uninterested in emigrating. Through January and February, Juan Miguel sent a number of open letters to the U.S. Government—published in, among other places, the Cuban newspaper Granma—demanding the return of his son and refusing the Miami relatives' demands. Chicago-based fathers' rights attorney Jeffery M. Leving spearheaded the amicus brief, which set the foundation of the custody case to reunite González with his father in Cuba. Manuel González, Elián Gonzalez's great uncle, later retained Leving to reunite González with his father. On March 21, Judge Kevin Michael Moore of the United States District Court for the Southern District of Florida dismissed the relatives' petition for asylum which they had filed on behalf of Elián González. Lázaro vowed to appeal. On March 29, Miami-Dade County Mayor Alex Penelas was joined by 22 other civic leaders in a speech in downtown Miami. Penelas indicated that the municipality would not cooperate with Federal authorities on any repatriation of the boy, and would not lend police assets or any other assistance in taking the boy. On April 14, a video was released in which Elián González tells Juan Miguel that he wants to stay in the United States. However, many thought that he had been coached, as a male voice was heard off-camera directing the young boy. In a September 2005 interview with 60 Minutes after being sent back to Cuba, González stated that during his stay in the U.S., his family members were "telling me bad things about [my father]", and "were also telling me to tell him that I did not want to go back to Cuba, and I always told them I wanted to." Elián González remained a subject of media attention as he went to Walt Disney World Resort one day, then met with politicians the next. Throughout the custody battle, opinion polls showed that a majority of Americans believed González should be returned to his father in Cuba, and that doing so was in the boy's best interest. On April 19, the 11th Circuit Court of Appeals in Atlanta ruled that González had to remain in the U.S. until the Miami Gonzálezes could appeal for an asylum hearing in May. Federal agent Jim Goldman (Assistant District Director, Investigations - Miami District INS) retrieves Elián from his relatives' home in Miami. This photo won the 2001 Pulitzer Prize for Breaking News. Attorney General Janet Reno ordered the return of Elián González to his father and set a deadline of April 13, 2000, but the Miami relatives defied the order. Negotiations continued for several days as the house was surrounded by protesters as well as police. The relatives insisted on guarantees that they could live with the child for several months and retain custody, and that González would not be returned to Cuba. Negotiations carried on throughout the night, but Reno claimed that the relatives rejected all workable solutions. A Florida family court judge revoked Lázaro's temporary custody, clearing the way for González to be returned to his father's custody. On April 20, Reno made the decision to remove González from the house and instructed law enforcement officials to determine the best time to obtain the boy. After being informed of the decision, Marisleysis said to a Justice Department community relations officer, "You think we just have cameras in the house? If people try to come in, they could be hurt." In the pre-dawn hours of Easter Eve, April 22, agents of the Border Patrol's special BORTAC unit as part of an operation in which more than 130 INS personnel took part approached the house, knocked on the door, and identified themselves. When no one responded, they entered. At the same time, pepper-spray and mace were employed against persons outside who attempted to interfere. In the confusion, Armando Gutierrez called in Alan Diaz, of the Associated Press, to enter the house and entered a room with González, his great uncle's wife Angela Lázaro, her niece, the niece's young son, and Donato Dalrymple (one of the two men who had rescued him from the ocean). They waited in the room listening to agents searching the house. Diaz took a widely publicized photograph of a border patrol agent confronting Dalrymple and the boy. INS also stated in the days after the raid that they had identified as many as two dozen persons who were "prepared to thwart any government operation", some of whom had concealed weapons while others had criminal records. Public opinion about the INS raid on the Miami González's house was widely polarized. There were two major focuses in media coverage of the event: the raid and the family reunions. A Time magazine issue showed a photo of a joyful González being reunited with his father (the caption says "Papa! "), while Newsweek ran an issue that focused on the raid, entitled "Seizing Elián". Elián González poses with his father, stepmother and half-brother in a photo taken a few hours after their reunion at Andrews Air Force Base. Four hours after he was taken from the house in Miami, González and his father were reunited at Andrews Air Force Base. The next day, the White House released a photograph showing a smiling González reunited with his father, which the Miami relatives disputed by claiming that it was a fake González in the photograph. Later, González and his family were taken to the Aspen Institute Wye River Conference Center (formerly known as "Wye Plantation"). The media were barred from access to the family. While the family was still at Andrews, New Hampshire Senator Bob Smith, escorting the Miami González relatives, was turned away from the base by guards. The May 5, 2000, Miami Herald reported that González was joined by his classmates (without their parents) and his teacher from his hometown, Cárdenas. Granma released pictures of Elián in the Young Pioneer uniform of Cuba's Communist youth league. On May 6, 2000, attorney Greg Craig took González and Juan Miguel to a dinner in the Georgetown neighborhood of Washington, D.C., hosted by Smith and Elizabeth Bagley. After González was returned to his father's custody, he remained in the U.S. while the Miami relatives exhausted their legal options. A three-judge federal panel had ruled that he could not go back to Cuba until he was granted an asylum hearing, but the case turned on the right of the relatives to request that hearing on behalf of the boy. On June 1, 2000, the 11th U.S. Circuit Court of Appeals ruled that Elián was too young to file for asylum; only his father could speak for him, and the relatives lacked legal standing. On June 28, 2000, the U.S. Supreme Court declined to review the decision. Later the same day, seven months and one week after Elián González left Cuba, he and his family returned there. Cuban president Fidel Castro (center) in 2003, whom Elián considered "not only as a friend but as a father". After his return Elián González lived with his father, stepmother, and three brothers in Cárdenas, where his father, Juan Miguel, was a waiter at an Italian restaurant at Josone Park, near Cardenas. Elián's father was interviewed at the restaurant in 2004 by Keith Morrison of the NBC News program Dateline NBC and Cover to Cover on CNBC. Juan Miguel filmed a home video on which González was shown doing his arithmetic homework with Juan Miguel in their dining room, going to bed in his bedroom with his two younger half-brothers, and attending karate lessons. Morrison's TV report also showed an 18th-century building in Cárdenas which was previously used as a fire station and which was renovated and inaugurated on July 14, 2001, as a museum, called Museo de la Batalla de Ideas ("Museum of the Battle of Ideas"), which includes an exhibition room dedicated to González, which houses a life-size bronze statue of González raising a clenched fist. The former González home in Miami has similarly been turned into a museum, with the boy's bedroom left unaltered. Juan Miguel is also a member of the National Assembly and has attended events for the Communist Party of Cuba with González, who has been called up to the stage to meet Fidel Castro. Castro also attended a filmed birthday party of González with his schoolmates. In September 2005, González was interviewed by 60 Minutes and stated during the interview that Fidel Castro was a friend, and that he considers Castro "not only as a friend but as a father"; González's aunt, Angela González, said she doubted whether the interview represented his true beliefs because of the controls imposed by Cuba on information. In December 2006, an ill Fidel Castro was unable to attend González's 13th birthday celebration, so his brother Raúl attended instead. On August 16, 2006, the United States Court of Appeals for the Eleventh Circuit affirmed the dismissal of an excessive force lawsuit brought by Dalrymple and others against the Federal Government and Reno. González joined the Young Communist Union of Cuba in June 2008 shortly after graduating from junior high school. At age 15, he began military school. In a November 2013 speech, González described his time in the United States as "very sad times for me, which marked me for my whole life", asserting that the Cuban Adjustment Act led to the denial of his rights, including "the right to be together with my father, the right to keep my nationality and to remain in my cultural context". Commentators have suggested that the Elián González affair may have been a factor in voters' decisions in the 2000 United States presidential election, which could have affected the close outcome in Florida. Al Gore's handling of the matter may have angered the predominantly Republican Cuban community over the boy's return to Cuba. Gore initially supported Republican legislation to give the boy and his father permanent residence status, but later supported the administration position. He was attacked by both sides in the dispute for his equivocal position. In 2015, González was studying to be an industrial engineer, and hoped to marry his high school sweetheart and fiancée, after finishing college. He stated that although he did not regret returning to Cuba, he would like to travel to the United States one day "to give my love to the American people". In July 2016, he received a degree in industrial engineering from the University of Matanzas, and read a letter to Fidel Castro from his graduating class, vowing "to fight from whatever trench the revolution demands". After graduating in 2016, González began working as a technology specialist at a state run company that makes large plastic water tanks. Elián is a 2017 documentary film directed by Ross McDonnell and Tim Golden, produced by Trevor Birney and executive produced by Alex Gibney. The film details the story of the young Cuban and has exclusive interviews with Elián González and his family in both Cuba and Miami. The film was co-produced by Fine Point Films and Jigsaw Productions and has a voiceover by Raul Esparza. The film premiered on April 19, 2017, at the Tribeca Film Festival. It opened in limited release in May, and appeared on CNN Films in August 2017. ^ "Elián González". Biography. February 28, 2019. ^ "Elian's relatives at war". BBC News. April 18, 2000. ^ Haberman, Clyde (January 14, 2000). "NYC; A Tug of War As Complex As War". The New York Times. ^ "UN fears for Haiti refugee plight". BBC. 2004-02-28. Retrieved 2007-06-18. ^ "Elián González Biography". Bio. Retrieved June 8, 2016. ^ a b Sue Plemming (27 March 2000). "Cuban boy draws picture of shipwreck drama". cubanet.org, quoting a Fox News article. Archived from the original on 12 January 2009. Retrieved 2008-10-06. ^ "The Politics of Elian". The Wall Street Journal. April 6, 2000. Retrieved April 14, 2015. ^ "Heroes' welcome for Elian grandmothers". BBC. 2000-01-30. Retrieved 2007-06-18. ^ "Spain backs Cuba over custody row". BBC. 2000-01-18. Retrieved 2007-06-18. ^ "Elian's father makes new appeal". BBC. 2000-02-15. Retrieved 2007-06-18. ^ The Group Who Filed Elian Gonzalez Brief, Supports INS Decision, PR Newswire, January 7, 2000. Retrieved August 29, 2016. ^ Jeffery Leving, attorney for Elian's great uncle Manuel Gonzalez, discusses the Elian Gonzalez custody hearing, CNN, May 11, 2000. Retrieved August 29, 2016. ^ Intervenor Applicant’s Resp. to Pls.’ and Defs.’ Opp’n to Mot. to Intervene and Mot. for Relief Under Rule 17(c) at 1, 14., Gonzalez v. Reno, 86 F. Supp. 2d (S.D. Fla. 2000) (No. 00-0206). ^ Kapos, Shia (November 5, 2013). "Elian Gonzalez case comes full circle for Jeffery Leving". Crain's Chicago Business. ^ "Elian asylum case dismissed". BBC. 2000-03-21. Retrieved 2007-06-18. ^ Padgett, Tim (June 28, 2015). "How The Battle Over Elián González Helped Change U.S. Cuba Policy". NPR. ^ "Elian interview sparks Miami row". BBC News. 30 September 2005. Retrieved 2008-10-06. ^ Newport, Frank (2000-04-04). "Americans Continue to Favor the Return of Elian Gonzalez to Cuba". Gallup News Service. Retrieved 2009-06-20. ^ Bragg, Rick. "THE ELIAN GONZALEZ CASE: THE OVERVIEW; CUBAN BOY STAYS IN U.S. FOR NOW, A COURT DECIDES." The New York Times, April 20, 2000. https://www.nytimes.com. ^ "2001 Pulitzer Prizes". www.pulitzer.org. ^ a b Martin, Patrick (2000-04-25). "Rescue of Elian Gonzalez intensifies political crisis in US". World Socialist Web Site. Retrieved 2007-06-18. ^ a b "D. C. Docket No. 03-20588-CV-KMM" (PDF). United States Court of Appeals for the Eleventh Circuit. 2006-08-16. Archived from the original (PDF) on 2007-06-15. Retrieved 2007-06-18. ^ Leahy, Patrick (2000-06-08). "Statement of Patrick Leahy, Ranking Member, Senate Judiciary Committee, Concerning the Elian Gonzalez Case Subpoena". United States Senate. Archived from the original on 2007-06-01. Retrieved 2007-06-18. ^ "Federal agents seize Elian in predawn raid: Boy to be reunited with his father in Maryland" Archived August 14, 2013, at the Wayback Machine. (April 22, 2000), CNN. ^ Smith, Terence (2000-04-24). "Dueling Images". Public Broadcasting Service. Retrieved 2007-06-18. ^ "Tufts Expert Says Privacy, Emotional Support Needed for Elian Gonzalez". Tufts E-News. 2000-04-24. Archived from the original on 2003-07-13. Retrieved 2007-06-18. ^ DeYoung, Karen (2000-04-23). "Raid Reunites Elian and Father; U.S. Agents Seize Boy From Relatives and Fly Him Here; Protests Erupt in Miami". The Washington Post. p. A01. ^ Robles, Frances; Wheat, Jack (2000-04-24). "Reunion Photo Stirs Controversy". The Miami Herald. p. 7A. ^ "Raid critics still plan Senate hearings on Elian". The Palm Beach Post. 2000-04-26. p. 10A. ^ Thomas, Evan (May 1, 2000). "Raid and Reunion". Newsweek. Retrieved April 14, 2015. ^ Borger, Julian (2000-05-30). "Soft landing for castaway Elian as Cuba rolls out tattered red carpet". The Guardian. ^ Sands, David R. (2000-06-02). "Elian's dad lauds court custody ruling". The Washington Times. ^ Bragg, Rick (2000-03-12). "Judges Ask Tough Questions About Cuban Boy's Interests". The New York Times. ^ "Court gives government and father deadline to respond in Elian Gonzalez case". CNN. 2000-06-15. Archived from the original on 2008-05-19. ^ "Supreme Court refuses to block Elian Gonzalez's return to Cuba". Associated Press. 2000-06-28. Archived from the original on 2012-10-25. ^ "Elian Gonzalez leaves U.S. for Cuba". CNN. 2000-06-28. Archived from the original on 2013-08-28. ^ a b "Elian interview sparks Miami row". BBC. 2005-09-30. Retrieved 2006-07-18. ^ Gonazelez, David (July 8, 2000). "Cardenas Journal; The Town That's Proud to Say Elian Lives Here". The New York Times. ^ a b Avila, Jim (2015). "Elian Gonzalez, Now Grown, Opens Up About Life in Cuba". ABC News. ^ Sequera, Vivian (November 23, 2000). "One year after fateful crossing, Elian is fading memory in Cuba" Archived 2016-04-01 at the Wayback Machine. The Topeka Capital-Journal (Topeka, Kansas). ^ Morrison, Keith (March 20, 2016). "Video of Elian Gonzales". Dateline NBC. ^ "Elian's Miami home turned into shrine". BBC. 2001-10-22. Retrieved 2007-06-18. ^ "Raul Castro Attends Elian Gonzalez's 13th Birthday Party". Fox News. Associated Press. 2006-12-06. Archived from the original on 2012-10-21. Retrieved 2008-06-15. ^ "Elian Gonzalez joins Cuba's youth Communists". CNN.com. Associated Press. 2008-06-15. Archived from the original on June 16, 2008. Retrieved 2008-06-15. ^ "Elian 'joins Cuba's communists'". BBC News. 2008-06-16. Retrieved 2010-05-01. ^ "Elián González: My Time In The U.S. 'Marked Me For My Whole Life'". Fox News Latino. November 19, 2013. Archived from the original on 2013-11-20. Retrieved 2013-11-19. ^ "Special Event". CNN. Retrieved 2010-05-01. ^ Seelye, Katharine Q. (2000-03-30). "Boy's Case Could Sway Bush-Gore Contest". The New York Times. Retrieved 2010-05-01. ^ "The Hispanic Vote and the U.S. Presidential Election". Knowledge@Wharton Network. 3 November 2004. Retrieved 2008-10-03. ^ Alter, Jonathan (2006-04-23). "Taking Sides". The New York Times. Retrieved 2010-05-01. ^ "MFAMEDIA.COM : The Saga of Elian Gonzalez: A News Media Riot?". ^ Clymer, Adam (2000-06-02). "While Conservatives and Liberals React, Gore and George Bush Hedge on Ruling". The New York Times. Retrieved 2008-06-15. ^ "Elián González, onetime political football, now a college grad in Cuba". Fox News Latino. 15 July 2016. Archived from the original on 2016-07-15. Retrieved 2016-07-16. ^ "Elián documentary revisits painful chapter in Cuban-American history". The Miami Herald. ^ CNN, Patrick Oppmann,. "Cuba's Elián González wants to reconcile with US relatives". ^ "ACLU amicus brief in the Elian Gonzalez matter, IN THE UNITED STATES DISTRICT COURT FOR THE SOUTHERN DISTRICT OF FLORIDA No. 00-0206-CIV-HOEVELER". Archived from the original on 2011-07-26. Allatson, Paul, and Molina Guzman, Isabel. "The Elián González Discursive Template: Mediating Children in Multiple Spheres of Conflict”, Journal of Children and Media 2.3 (September 2008): 248–63. de la Cova, Antonio Rafael. "The Elian Gonzalez Case: The World's Most Watched and Politically-Charged Custody Battle that Reached the U.S. Supreme Court and Determined a Presidential Election", Harvard Latino Law Review, Vol. 18, Spring 2015, pp. 501–49. De La Torre, Miguel A., "La Lucha for Cuba: Religion and Politics on the Streets of Miami", University of California Press, 2003. "The Year In Pictures: Elian Gonzalez". Time. 2000. Archived from the original on July 9, 2007. Retrieved 2007-06-18. García Márquez, Gabriel (2000-03-29). "Elián: Shipwrecked On Dry Land". Juventud Rebelde. Archived from the original on 2013-06-17. Morrison, Keith (2004-08-01). "Finding Elian". Dateline NBC. MSNBC. Gibbs, Stephen (2005-04-22). "What happened to Elian Gonzalez?". BBC. This page was last edited on 26 March 2019, at 11:31 (UTC).